to that of straightened lines and softened hues. The original is available here. If you are interested in a print simply let me know and I can create one for you in ACEO or 5×7 size. *An ACEO stands for Art Cards, Editions and Originals. they always measure 3.5″ by 2.5″ and can be created from any medium. They are an awesome way to collect affordable art. Look What Popped Up from the Ground made the front page of Etsy not once but twice. Wow… thank you! It is an ACEO which stands for Art Cards, Editions and Originals. 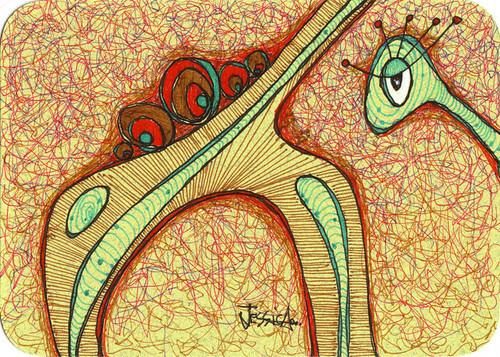 It is for sale in my shop in ACEO mini print format and in 5×7 inch size. Created on a lime light yellow rounded corner acid free card stock. I drew on this stock with professional Pilot Pens. Good Morning Sunshine is dated, titled and signed on the back in pencil. This is an original and not a print. Yes, it is an ACEO. An ACEO stands for Art Cards, Editions and Originals. This little guy greeting the new day is available in my art shop. The original illustration has since sold. However, Good Morning Sunshine is available in a Limited Edition run of 25 only. 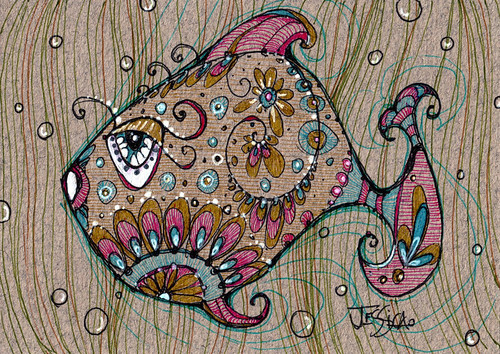 This deco fish named Francis was drawn with professional quality Pilot pens on cotton acid free Canson paper. If you would like to see Francis up close and personal simply become my flickr contact and you can swim with him at 1000 pixels wide rather than the 500 pixels wide that I can only display here on my blog. And if you need Francis swimming beside you all the time he was caught recently hanging out in my art shop. He bit the bait what could I do!